Twitter is a one-man show. One has complete freedom of expression, including, if one chooses, the freedom to be scurrilous, abusive, and seditious; or, on the other hand, to be more detailed, serious and ‘high-brow’ than is ever possible in a newspaper or in most kinds of periodicals. At the same time, since Twitter is always short, it can be produced much more quickly than a book, and in principle, at any rate, can reach a bigger public. Above all, Twitter does not have to follow any prescribed pattern... All that is required of it is that it shall be topical, polemical, and short. Prof. Bailyn didn't actually write that. He wrote that years ago in The Idealogical Origins of the American Revolution, and was talking about the role that pamphlets played in socializing the ideas that laid the foundation of the revolution. I've made this point before, in 2003 when I first read Bailyn's book - back then, my focus was weblogs. In 18th century America, pamphlets were the fastest, easiest, most unfiltered way of distributing content. Today we have blogs and Twitter - but the dynamics that make them so compelling are the very same ones that made pamphlets so powerful 225 years ago. Back in January, we set up the official Blogger account on Twitter. We had a general idea of what we hoped to accomplish - better interaction with passionate users, quick communication of known issues, bug fixes, etc. - but this was not a long planned deliberate move by us. If anything, it was a bit of an experiment. Setting up a username makes monitoring Twitter much easier. This was a particularly acute problem for Blogger, since "blogger" is a pretty generic term. Setting up a persistent query for "blogger" yielded far too many hits per minute to be worthwhile... weeding through all of them to find the few that were specifically about big-B Blogger would take all day. Searching for "@blogger", by contrast, is much easier and more effective. Replying as an individual is sometimes better than replying as the brand: The traffic of replies directed to @blogger varies from a couple a day to a few dozen (after launches like our Friend Connect integration), and some of those tweets are pretty specific to the individual user. Learning from Max Kalehoff's experiences at Clickable, in mid-February I started replying more as myself (@rklau) when the tweet was specific to the user. This has two advantages (at least): reducing the noise from the actual Blogger account to the more than 8,000 followers, and establishing a more personal connection between the user and myself. And I'm not alone - several other Blogger team members are engaged, and reaching out directly to users. Reactions are uniformly positive: people love knowing that individuals are involved, that we care about the product, and that we are trying to improve their Blogger experience. Negative feedback and user frustration are part of the cost of admission: Not everyone is going to be thrilled with everything we do, and we needed to be comfortable with surfacing that frustration once we got active on Twitter. It's possible to turn frustrated users into fans with just a single message (see here: "Makes me sad!" "Try..." "OMG I love you! "), but the key is to engage users when appropriate, and offer guidance if you have any to give. Users will help you do your job once you commit: This was true at FeedBurner when we used persistent RSS queries to surface blog posts and comments about FeedBurner so we could respond rapidly, and it's no less true today: once you open up this channel of communications, your users will help you spread the word. We won't catch every comment intended for us (not everyone knows we're on Twitter, for starters) - but the clusters of friends and followers often means that one of our followers will be following someone else who could use our help. When one person asks about unexpected behavior on Blogger, one of our followers will direct them to the right place. This is not a rare occurrence, and it creates a wonderful network effect that routinely amplifies our communications. Ask questions. If you wait for everyone to ask you questions, you'll be reactive and you'll set the expectation that people will only hear from you when they complain. It's increasingly clear to us that a lot of Blogger users don't know that there are lots of options for customizing their templates available on the web, so last week we asked followers for their favorite recommendations. I'm summarizing those recommendations and will put a post on Blogger Buzz later today. (Which, of course, will get posted to Twitter as well.) Important note: if you ask questions, be prepared to act on the replies you get. Readers whose replies go into an apparent black hole will not be happy. Be consistent. This is very much an extension of our "voice" online, and as such we've tried to ensure that when we do post, it sounds like us. 140 characters (the limit on Twitter messages) can be very restrictive, so ensuring that consistency is not always easy. This is particularly tricky if you're posting from multiple sources (corp blog, known issues, etc.) - so make sure some thought goes into how those posts are communicated, not just what is communicated. As experiments go, this has been quite successful. We're reinforcing to users that we are listening and that we care about their experiences with the product (good and bad). It's no silver bullet - building and maintaining the product still require a tremendous investment of time and energy - but as part of a larger commitment to making a great product and keeping our users happy, it's absolutely a worthwhile investment. On my way out the door to SXSW, I walked past the bookshelf in our bedroom and took The Dark Tower off the shelf. I originally read the entire Dark Tower series in 2005, effectively back-to-back-to-back, and adored them. I can't really recall a Stephen King book I haven't enjoyed, but a few stand out: my favorite is The Stand (which I've read 4 or 5 times), and a few others that I recall rather vividly are The Mist (a short story in The Skeleton Crew), It, and The Shining. But as I'm 2/3 of the way through The Dark Tower, I'm coming to the realization that as good as The Stand is (and if you haven't read it, you really must), The Dark Tower is in a league of its own. In just a few hundred pages, King establishes a more epic landscape, with characters who are more intriguing, with a story arc that is breathtaking, than any other author I've ever read. For those that don't know the story of the Dark Tower, it's part Western, part science fiction, part fantasy, and just a little bit of horror thrown in for good measure (but not much). Most interestingly, countless other King works are referenced throughout: characters, places, and themes from other stories pop up in the most unexpected places. If you're a King fan, this is the series that makes his entire body of work fit together - not always how you'd expect it to, either. I told a friend at SXSW I was re-reading the Dark Tower series (it's a total of 7 books, written by King over three decades), he marveled that I'd do so, particularly knowing how it ends. If you've read it, you might be able to appreciate why I think it's kind of poetic to be reading it again (I'll leave it at that, don't want to give anything away to the uninitiated). Bottom line: if you love well-written, character driven stories that completely transport you to another place and another time, the Dark Tower series will not let you down. Swapped out the header for a header image. I took the photo in the header at Yosemite and still really like it. The color choices for the rest of the template stem from this (again, if you need to get colors from a photo, can't recommend this site highly enough). Adjusted the width of the main column and the far-right sidebar. For the stuff I wanted to put in this sidebar, 150 pixels was a bit too narrow. Since the header image was 1024 pixels wide, I adjusted the widths to stretch the content to 1024 pixels as well. Removed the search bar in the navbar below the header image. I prefer the functionality of our Custom Search widget (available on Blogger in Draft), so instead I swapped in a few icons of the places I'm most likely to have additional content (Twitter, Picasa, my CV, etc.). In deciding which ads to put on the site, followed the guidance offered a few years back on the AdSense blog - nothing earth-shattering, but still useful info if you're looking to add AdSense to your blog. Followed Amanda's own instructions about how to get the embedded comment form to appear in a custom template. This is a simple fix, and I much prefer the embedded comment form to a separate page or a pop-up window. Slightly modified the presentation of comments to simplify the text a bit. Overall, I'm much happier with how the site looks. More importantly, I think it loads more quickly - and I may end up ripping out a few more things to streamline things further. If you're looking to pick a new design for your Blogger blog, check out some of the recent replies to @Blogger on Twitter: several good recommendations in there. Do you have any tips/tricks on making your Blogger site better? Share them in the comments. I'd been invited to speak at a couple SXSW conferences but had conflicts each time. Ironically, I'm not speaking this year but given Blogger's long history with SXSW, I was eager to come and see what the fuss was about. I'm glad I'm here. I've attended dozens of tech and industry conferences over the years, and SXSW is by far the best place to meet a broad cross-section of the tech world. In the span of a couple hours last night, I went from chatting with Amazon's CTO to the organizers of The Next Web conference in Europe to a VC with a top-tier VC firm to the founder of Upcoming.org to the blogs editor for the LA Times. And then there's the users who were thrilled to share their Blogger experiences, partners who want to chat about how we might work together, and press who want to hear what's new. I've met countless people who I've "known" online - in several cases for years - but only this weekend met in person. The panels are a mixed bag, as you'd expect a conference which caters to such a diverse audience might be. The caliber of the speakers is mostly outstanding, and the audiences are highly engaged. Which brings me to... Twitter! This conference wouldn't be half as good without Twitter. Whether it's dedicated hash tags for sessions whose posts are then displayed on-screen during the session to facilitate audience Q&A (and non-attendees who are following live reports) and give the audience better visibility to their fellow audience members, rapid dissemination of info across the loosely joined network of friends/followers, or the ability to direct message anyone in your network in order to exchange info (I have many more Twitter followers than I have mobile numbers in my address book, making Twitter preferable to SMS for direct messages) - Twitter has made the interactions at SXSW far, far better. Speaking of Twitter, funny story: Saturday night I tweeted that I was enjoying a Smithwick's ale at Fado, a great Irish pub in Austin. A few minutes later, my phone buzzed. Turns out, it was the bar tweeting me back. We're truly living in the future. I leave for SXSW tomorrow, and will be there through Tuesday. While I really don't like traveling over weekends without the family, Blogger has a long history at SXSW and I didn't feel that I could miss this. We're having a party with Google Reader Sunday night, so if you're in the Austin area please stop by and say hi. If my prediction holds true, Erik will have broken Reader's nifty new "comments" feature by then and we'll all be drowning our sorrows in Scotch. If you're at SXSW, would love to meet up. Earlier this week, a friend of mine's father passed away from a sudden heart attack. 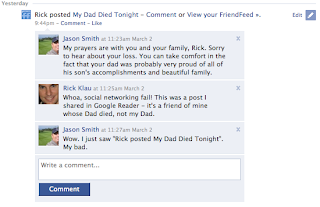 He blogged about his father's loss, and I did what I normally do when I see a post in Google Reader that I find noteworthy, interesting or worth coming back to: I shared it in Google Reader. Then I shared my condolences with this friend on Twitter (who, tragically, was dealt another blow when his brother's wife died from an allergic reaction to insulin the very next day), and went about my day. But this post is about what happened next: I have set FriendFeed up to aggregate most of my content. Ironically, I don't really use FriendFeed - but there are some friends who prefer to read my stuff there. And since I don't have to do any work once I set it up, I just leave it be. At some point last year, I configured FriendFeed to talk to Facebook. All that really means is that any content that shows up in FriendFeed flows through to Facebook as an entry in my profile. Here's where some important context got lost: FriendFeed's vernacular in the Facebook app is to say that I posted something - implying a more overt act than simply sharing something someone else wrote in Google Reader (which is what I actually did). Not an hour later, another friend saw my note and assumed that I had written that my Dad had passed away. Interesting lesson for those of us who think about integrations between products: thanks to the loosely joined nature of the web, it becomes easy to use those integrations for integrations. And before long, what you say - and how you say it - matters a lot. My first job was as a dish-washer at Chez Claude restaurant in Acton, Massachusetts. It was a family-owned French restaurant, and I wasn't yet old enough to drive, so my parents had to drop me off at 4pm every Saturday and pick me up after we closed (usually around 11). I eventually graduated from washing dishes to food prep (salads and desserts), then bused tables and also did some stints as the host. I think I made $6/hour, and when I bused tables the waitresses would share some of the tips with me. I loved the restaurant, and proposed to my wife there in 1996. The restaurant is closed now.